Krrish 3 Box Office Report : Breaks Record For Highest Collection in A Day. Krrish 3 is now also part of Top 10 Bollywood Movies of 2013. Records have now been broken by Krrish3's 35.91 Crore figure. The Fourth Day Monday box office figures for Krrish 3 are record breaking and are highest ever collections by a Hindi movie in a single day by both trade and producers figure. Krrish 3 is now also part of Top 10 Bollywood Movies of 2013. Monday was the day when North and Central India had a holiday and collections doubled across multiplexes with family audiences in full swing. Both Chennai Express and Ek Tha Tiger had collected more than 30 Crore nett in a single day, but Krrish 3 has broken their record. The highest single day collection figure by producers was Rs 33.12 Crore for Chennai Express followed by Ek Tha Tiger's Rs 32.93 Crore. The previous highest third day collection record as per producers figure was also of Chennai Express having collected Rs 32.5 Crore. All of these records have now been broken by Krrish3's 35.91 Crore figure. It has also matched Chennai express in reaching to 100 crores in 4 days as per producers figure. 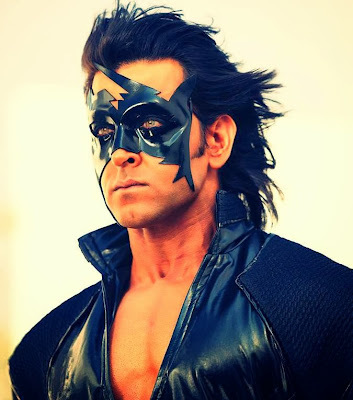 Krrish 3's Budget is 115 Crores(Cost + P&A), So It seems that It would get hit verdict on Tuesday, but it will definitely make profits and its verdict will be more clear over next few days. Hoping a Blockbuster Verdict from this movie.